Next message: Kevin Bracey: "Re: Apostrophes for Krauts"
Previous message: Markus Kuhn: "Re: Historic versus modern ASCII quotes"
Next in thread: Kevin Bracey: "Re: Apostrophes for Krauts"
Maybe reply: Kevin Bracey: "Re: Apostrophes for Krauts"
Maybe reply: Otto Stolz: "Re: Apostrophes for Krauts"
in charge for serious consideration. a high-resolution device (at least to anyone with a typographer's eye). print publications, CD cover texts, poster's, and many other places. 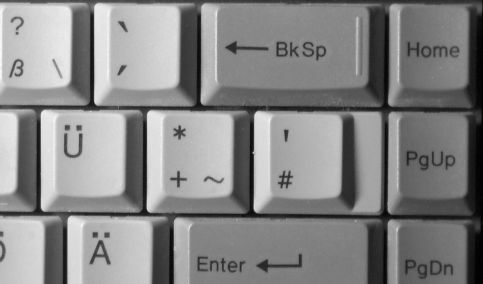 Many Germans write "it�s" and "doesn�t" instead of "it's" and "doesn't". English apostrophe, it is misused for that purpose frequently. the U+0027 APOSTROPHE key has been pressed. anything but entering French accents on to of other base letters.